2018 Christmas Cards on Sale Now! 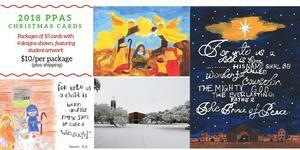 We have a limited quantity of PPAS Christmas cards (featuring student artwork) for sale! These 5X7 cards come in packages of 10 with a mixture of the four designs shown for $10.00, plus shipping and handling (U.S. addresses only).